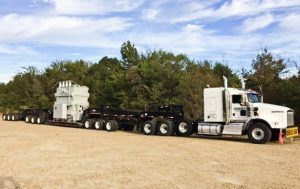 What is an oversize load? It’s a load that exceeds the standard/ordinary legal size and/or weight limits for a specific portion of road, highway or other infrastructure (such as a bridge or tunnel). What are some examples of oversize loads? Pre-built homes, containers, cranes, front loaders, backhoes, bridge beams, generators, windmill propellers, rocket stages and industrial equipment are all examples. Typically, oversize loads require a special permit (and extra fees) to legally traverse roadways. Permits may even go so far as to designate the route to be taken, as well as dates and times allowed for travel. When you see a pilot vehicle, that’s your cue to be ready to slow down and move over to let the oversize load pass you by– in some cases you might even need to pull to the side of the roadway and bring your own vehicle to a complete and full stop. Pay attention to the driver of the pilot vehicle, as he or she might use hand signals to ask you to either slow down or pull over. Keep in mind that even though the oversize load is getting in your way, it’s important to have patience. Some people make the mistake of not leaving the oversize load any room to pass– and they may even try to pass it first rather than let it pass them. This can be foolish. Loaded trucks have a longer braking distance than unloaded ones, and/or “civilian” cars and trucks nearby. Do you really want to attempt to overtake an oversize load? Don’t do it. You’ve probably heard this before, but it bears repeating here: if you cannot see the truck driver in their mirrors, they’re unable to see you. Oversize loads can be gargantuan. Give them lots of room (and time) to safely pass you.